“The key to a free and fair election rests more in the hands of over 60 per cent of Nigeria’s population who happen to be under the age of 35 and they should be key players in the drive for a free and fair election borrowing a leaf from the South Africa’s just held election which saw Jacob Zuma going for a second term under the African National Congress. No doubt, the South African election had its own challenges; the Nigeria 2015 election must defy her odds“. THE year 2015 would test the continuation of Africa’s democracy. With the Nigerian electorate spending St. Valentine’s Day 2015 on the queue choosing their next leader, one thing is certain, democratic process in Nigeria would be tested fiercely in the upcoming polls come 2015. In retrospect, Nigeria’s Fourth Republic (1999 – present) ushered in a democratic era where the People’s Democratic Party (PDP) has held the power at the centre of affairs. With the emergence of the All Progressives Congress (APC), an alliance of political parties, the Nigerian election will no doubt be fiercely contested come 2015. The key to a free and fair election rests more in the hands of over 60 per cent of Nigeria’s population who happen to be under the age of 35 and they should be key players in the drive for a free and fair election borrowing a leaf from the South Africa’s just held election which saw Jacob Zuma going for a second term under the African National Congress. No doubt, the South African election had its own challenges; the Nigeria 2015 election must defy her odds. African youths’ demands from our governments are similar only varying slightly. We are clamouring for participation and the past four years have revealed the tilt in the balance of power towards the youth. Burkina Faso yesterday borrowed a leaf from the Arab spring by going to the street to protest against one of the oldest African government and the result chronicled into a military coup in the year 2014! The Arab Spring in Egypt is a great indicator of this tilt in power to favour young people. In 2011, 30-year-old Google executive WaelGhonim with the aid of an anonymous Facebook account mobilised tens of thousands to Tahrir square on a protest of the killing of Kullena KhaledSaeed. Kullena was a 28-year-old man who died in undisputed circumstances in 2010 after being arrested by Egyptian policemen. The whole world watched the exit of President Mubarak of Egypt through the power wielded by these young minds led by WaelGhonim. If the effect of the Egyptian revolution was a fluke, I guess the spread and what is now referred to as Arab Spring (Uprising) and its effect must get your attention! The social media has proved to be a powerful mobilisation tool. I recommend WaelGhonim’s master piece Revolution 2.0. It gives one a glimpse of what the power of the youth could result when it is channeled appropriately. Having lived in Nigeria all my life, I am tempted to believe that young people can make a change. With her population, Nigerian youths, I believe, have numbers to make this change and in politics, numbers is everything. • Educate teenagers who are turning 18 years on the power of their vote and why they must let it count. This responsibility goes more to NYSC members of the 2014/ 2015 batch, and youth advocates. You are advised to choose community development projects in this light since you are going to communicate more with youths at the grassroots; that doesn’t exempt every one of us though. • Registration of voters: Young people should mobilise their peers to register and get a voters card. This can also go as a project. It is very simple; the goal of the project manager here is to inform the public on the number he or she has influenced to register through social media and other platforms and we take it up from there. • Expose track records of contestants: We seem to be guilty of political amnesia in Nigeria. It will be good if some of us remind the electorate of past records of contestants; this will help people make wise choices. We do not mean sophistries or maligning campaigns that simply scream “anti-politics” but factual opinions that help people make their decisions without being biased. • Join a political party: When young people join political parties in legions, they count and are able to influence decision making. Whichever way we argue this point it is a fact that getting involved in this way irrespective of how “dirty” we think is one point we should reconsider. • Go social: Be a photo journalist and report all election results with your Smart phone. During the build up to election, please be careful while using this platform. Negotiate how long their so-called stomach infrastructure would last and choose beyond their present. The reality on ground from feelers among young people is that even after all these pieces of advice, the present crop of politicians in power, with due respect to their offices, are either too corrupt or do not fit the bill. Interesting as that may sound, such feelings are scary since they can cause much voter apathy and leave us on the same spot. I would rather negotiate our options clearly and choose those options that are, at least, close to our ideal situation. If we don’t we would lack the poetic licence to give our opinions after 2015. You might not agree with all the opinions here; however, they are simply opinions from people. As we count down to 2015, let us exercise our power of numbers and always remember that “the power of the people is greater than the people in power” as WaelGhonim would say. The floor is yours….it is also mine. 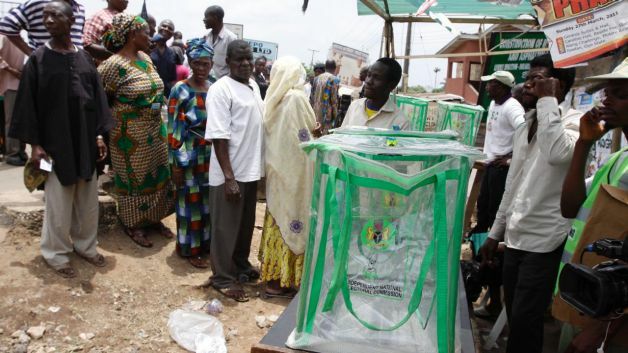 How can young people in Nigeria play their role effectively in Nigeria’s upcoming election? That is the issue.